Students in 7th and 8th grade write about "Why I Want to Go to College"
OMAHA, Neb. 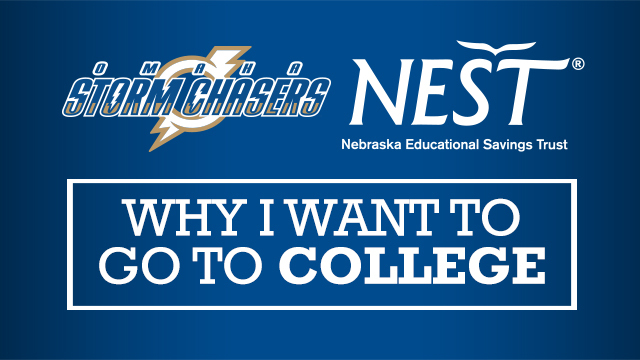 - The Nebraska Educational Savings Trust (NEST) and the Omaha Storm Chasers have officially kicked off the 13th-annual "Why I Want to Go to College" essay contest, Nebraska State Treasurer Don Stenberg announced today. Students in 7th and 8th grade both in and outside the state of Nebraska may send their entries until the March 27 deadline. Essays must be 750 words or less, describing the student's educational goals and dreams for the future. Entries must be typed, double-spaced on 8 1/2 by 11" paper and must be the student's original work. Each entry must be accompanied with the required cover sheet found here: http://treasurer.nebraska.gov/csp/scholarships/essay/college/2015/2015writingContestCoverSheet.pdf. Judging will be conducted by faculty and students in the College of Education at the University of Nebraska at Omaha. The essay contest awards 1st, 2nd and 3rd place winners in each of Nebraska's three congressional districts, as well as Out-of-State, with winners earning prizes of $2,000, $1,000 and $500 toward a NEST College Savings Plan. All winners from Nebraska, which will be notified in early May, receive four box seat tickets and earn recognition prior to the Storm Chasers game on May 10 against the Oklahoma City Dodgers. Each winning student will get an opportunity to meet Nebraska State Treasurer Stenberg during the visit.